Another Lad passed me onto Prince Paddy after an ASEM, due to his Ice Sculpting prowess..But for some reason that wasn't to be the case.. Thanks for the mail unfortunately I cannot help you in this matter you speak of but perhaps you can help me. I run a successful Custom business in the UK. My daughter is getting married in the new year. She is marrying an African Artist that carves amazing staues of African Art for a living. She herself is an Ice Sculptress. My plan is to have a genuine African Artist do an Ice Sculpture for the both of them for the wedding. Hopefully you may know of an artist capable of Sulpting Ice I would be eternally greatful if you could help me solicit his services. I am willing to pay you �5,000. You can pay the artist any price you see fit. All I require is this special Ice Sculpture and fast as an extraordinary Wedding present. I have hired a refrigeration courrier company that I can have in place to collect it from you at your nearest Airport. Rest assured I have planned this to a tee and everything is set. All I need is an artist to the Ice Sculpture. I want it to be sculpted in Africa by an African Artist to honour my daughter's Fiance's heritage and skills. If your interested please reply and I can send you some pics of what the sculpture will be. I hope you will make my daughters day that extra little bit more special. 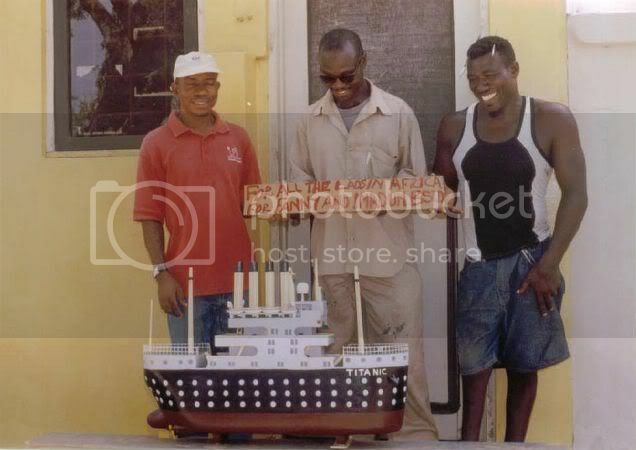 You know I have already lost �1,000 to a man claiming to be a sculptor and he asked for a depsit. Now I'm not saying you are the same but I am not in a position to advance you any deposit. If this is not acceptable then I guess we may go our seperate ways. 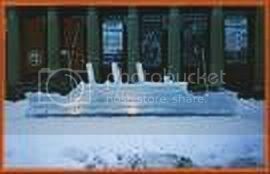 I have attatched pics of what I would like the Ice Sculputre to be of. Fanny's favourite movie is Titanic so I would love for the Ice Sculpture to be of the Titanic. I would like it to be at least 10 inches in height and at least 24 inches in length. Email me which airport is nearest to you and I will arrange for the courrier to pick it up when you are ready within 24 hrs of your notification. Everything is set so I hope you can complete the ice sculpture as quick as possible. Before I arrange for the courier to arrive and send you any money, I will need you to send me some photos of the piece from different angles and also as a special favour can you include a special note for my daughter Fanny and Imadum in the photos. The sooner you can send me the photos I will be able to authorise my accountants to release your payment of 5,000. I ask you to do this for two reasons. 1. To be sure there are no problems with the piece and to grasp it's size. 2. I would like you to be photographed smiling behind the piece holding a banner or sign saying. I need this little favour from you as it will prove to my daughter and her fiance the ice sculpture was made especially for them in Africa and also let her see the great men responsible for creating their Ice Sculpture. As soon as you send me the photos of the piece I will arrange for your payment. So I will need some money transfer details also. I hope you understand my instructions and I pray you do a good job and remember this is so important to me and I have planned it for weeks. Please don't let me down as I fear I will not have time ro find someone else. Can you assure me you can do this?? ?..If so I thank you from the bottom of my heart and shall pay you for all your work with great pleasure and I hope this will turn out to be a wonderful Christmas for all of us. I attached the 1st three pics..Rest of them are from a Lad that tried to say he was an Ice Sculptor and had the Titanic in stock..Gotta love it..he he.. This is wonderful news I am so happy. I am super serious about this as it will be a spectacular present for Fanny and Imadum. I am going to great lengths to contact you and explain this. So you can relax nothing you do or will do is in vain. The Wedding is set for the 2nd of February so we have plenty of time. I have already explained that I have a refrigeration courrier company on standby to collect the Ice Sculpture from you at your nearset airport. So I need to know what your nearest airport is. All I require from you is to take it to the airport. Now onto the photos I sent. I sent you a few so the artist would have a good idea of what I wanted. I do not need five sculptures. He is to create one using the photos I sent as a reference. I have checked my phone and it appears I have some missed calls. I have tried to call you but it won't seem to connect. Maybe if you called me around 5pm London time. Or if you prefer we could talk on yahoo chat. It's free and has no bad connections. I have been able to print the pics boldly so that the Artist can be able to see them clearly and make good use of them. I was at their office today to see the director of the company, I had long conversations with him and he assured me that they will deliver however he insisted that I should deposit some money as a moblization fee before the comencement of the job acording to his explainations, they have rules and regulations guiding their mode of operation. I have already paid sum amount of money the first day I visited their office which they said is a fee for job card I have the receipt with me here. A Mr Mark Green has been kindly helping me organise the creation of an Ice Sculpture of the Titanic for my daughters wedding. I hope you have all the reference photos I sent him for the piece to be designed from. Can you inform me of your progress thus far please and thanks. I have already informed Mark of my previous loss of �1,000 to a man laiming to be a an Ice Sculptor so I need it to be clear that I will not be forwarding any advance mobilization fees. This is purely for my own security and rest assured once I see photographic evidence of the finished piece I will be in a position to forward you your fees. OUR COMPANY RECEIVED A FORWARDED MESSAGE FROM YOUR PARTNER MR.MARK GREEN. IT IS VERY UNFORTUNATE THAT YOU HAD A BAD EXPERIENCE IN THE PAST BUT THAT WILL NOT AUTOMATICALLY CHANGE OUR COMPANY RULES AND MODE OF TRANSACTION. IN THE PAST YOU TRANSACTED A BUSINESS WITH AN INDIVIDUAL AND OFCOURSE A WRONG PERSON BUT NOW YOU ARE DEALING WITH A COMPANY AND THE RIGHT PEOPLE. THIS COMPANY HAS A LAID DOWN RULES AND PROCEDURES, WHEN YOU CONTACT US TO DO A JOB FOR YOU WE GIVE A JOB CARD TO FILL WITH SOME TOKEN AMOUNT OF MONEY THEN AFTER THAT YOU GIVE US SPECIFICATION OF THE JOB YOU WANT US TO DO FOR YOU, WE GO AHEAD AND NEGOTIATE PRICE WITH YOU AND BEFORE WE START THE WORK YOU ARE REQUIRED TO MAKE A PART PAYMENT OF 25% OF THE TOTAL COST, THEN WE WILL GO AHEAD TO USE OUR MONEY TO COMPLETE THE REST OF THE JOB. IT IS IMPORTANT TO NOTE THAT ANY MONEY WE RECEIVE WE ISSUE OFFICIAL COMPANY RECEIPT FOR IT AND WE WILL ENTER INTO IREVOCABLE AGREEMENT WHICH IS TO BE SIGNED BY BOTH PARTIES, IF WE DID NOT DO THE WORK TO YOUR SATISFACTION WE WILL PAY YOU BACK THE 25% DEPOSIT YOU MADE AND WE WILL BEAR THE LOSS. PLS GET BACK TO US LET US KNOW IF YOU ARE OK WITH OUR TERMS AND WE WILL START THE WORK WITHOUT FURTHER DELAYS. 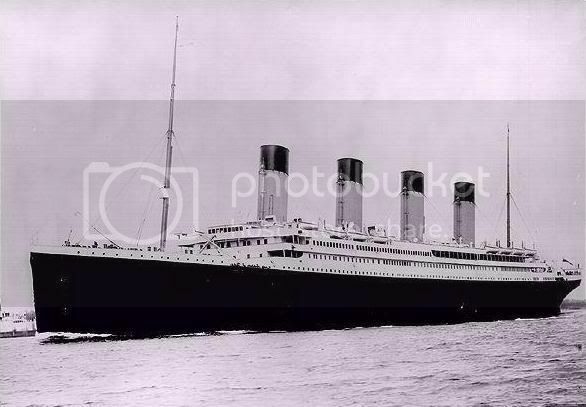 WE HAVE THE PICS OF THE TITANIC SHIP AND WE ARE ASURING YOU THAT WE WILL DO A GOOD JOB THAT WILL GLADEN YOUR HEART AND THAT OF YOUR DAUGHTER. IF YOU WOULD WANT US TO PUT THE PICTURE OF YOUR DAUGHTER AND THAT OF THE HUSBAND ON THE SHIP YOU CAN SEND THE PICTURES AS SOON AS POSSIBLE. This is a message from my partner, kindly give it due considerations and attention. Huh? ?..These Lads are few snots short of a snotball mereckons..
Well I am not prepared to advanced to advance any funds. It is not an attack on your company's credibility, it is a security precaution for my own peace of mind. Having said that I feel I am going circles and don't think I can continue with the commision of this Ice Sculpture. I am prepared to pay �5,000 which is way over the actual cost, but only once I see photographic evidence of the finished Ice Sculpture. These are my terms and if you cannot operate under them, then we have no more to discuss. WE HAVE RECEIVED AND READ YOUR E-MAIL MESSAGE AT OUR OFFICE THIS MORNING. WE HAVE ALSO MADE SOME ANALITICAL VIEWS OVER THE WHOLE ISSUE, WE COME TO A CONCLUSSION THAT THE GAMBLE IS WORTH TRYING. WE ARE NOT DOUBTING YOUR CAPABILITY TO PAY FOR THE WORK, BUT WHAT GAURANTY DO WE HAVE THAT AFTER THE JOB IS DONE THAT WE WILL GET OUR MONEY? REMEMBER THAT IN ORDER FOR US TO MEET UP AND DELIVER THIS JOB IN TWO WEEKS AS YOUR PARTNER MR.MARK REQUESTED, WE MUST SUSPEND SOME OTHER JOBS WE ARE DOING AT THE MOMENT AND GIVE EVERY ATTENTION TO YOURS AND OFCOURSE WE HAVE TO DO A GOOD AND NEAT WORK HERE IN ORDER TO ADVERTISE AND BOOST THE IMAGE OF OUR COMPANY OVER THERE. WE ARE WILLING TO START THIS WORK BUT BEFORE THEN CAN WE REACH AN AGREEMENT IN WRITTING TO BE SIGNED BY BOTH PARTIES? AND WE SHALL BE NEEDING YOUR FAX NUMBERS AND IF POSSIBLE A FIXED TELEPHONE LINE BECAUSE WE'VE TRIED COUPLE OF TIMES TO REACH YOU ON THE NUMBER GIVEN TO US BUT WE COULDN'T GET THROUGH. PLEASE DON'T THINK THAT WE ARE DIFFICULT, WE ARE ONLY DOING THIS FOR SECURITY REASONS SINCE NO REASONABLE COMPANY WOULD WANT TO WASTE TIME, MONEY AND ENERGY PURSUING SHADOWS. LET US HEAR FROM YOU SOONEST SO AS TO ENABLE US START THE WORK. WE ARE OF THE BELIEVE THAT YOU WILL BE GLAD TO DO BUSINESS WITH US AFTER THIS. I have noticed you refer to me as Madam. I am a Man. I am not offended but I would like to clear that up. I am so pleased you have reconsidered. You have lifted a great weight from my shoulders. My recent embarrasment and loss has really hurt me and I just want to be really sure this time. As for why I can garuntee your payments..It's very plain and simple. I want the Ice Sculpture badly. Your company will have it. The only way I can get it from you is by paying you. I have nothing to gain by not paying you. I have had this idea and planned to make it a reality for a month now. You are my last hope and honestly I cannot make my position or things anymore clear. It is odd and quite frustrating as I would like to speak with you. However we shall move forward regardless as we understand each other as we stand and I doubt a phone call would make that much difference at this stage. Email me whatever documents you need me to sign and I shall. I don't want faxes about this coming through as I'm trying to keep it as a surprise. If you prefer you can add me on yahoo chat. Anyway thank you very much for your understanding and I wish you Godspeed. Sure enough he was rining me like mad..Mostly hang ups..But.. ACCEPT OUR SINCERE APPOLOGIES FOR ADDRESSING YOU AS A MADAM, I THINK THE MISE UP IS FROM YOUR PARTNER MR.MARK WHO MADE THE FIRST INTRODUCTION TO US. IT WILL BE EASIER FOR US TO SEND AN AGREEMENT LETTER TO YOU THROUGH FAX, THEN YOU SIGN IT AND FAX A COPY BACK TO US. AS FOR CHATING ON THE NET WE DON'T HAVE MUCH TIME FOR THAT BECAUSE OF THE NATURE OF OUR JOB. WE'VE BE CALLING YOU AND WE ARE NOT GETTING THROUGH, WHY DON'T YOU CALL US FOR ONCE SO AS TO ENABLE US KNOW IF WE ARE DEALING WITH A MAN, WOMAN OR SPIRIT. OUR PEOPLE SAYS THAT, "SPOKEN WORDS ARE THE INTENT OF HEART SEEN"
As I have said before. This is a surprise for my daughter. A lot of people in my office have access to the fax machine. I don't want that to spoil my surprise. So I suggest you scan the document and email it to me. I'll print it out, sign it and re scan it back to you. As for being a spirit. I am very much alive and kicking thank you very much. For your information I am actually typing this mail to you right now. It is not my fault we haven't spoken. I do not know what the problem is. However you may try reach me on this number also. +4470xxxxxx. Personally I do not see what a phone call will achieve. I need action at this stage. The wedding date is colsing fast. HAVING COME SO FAR I THINK WE CAN GIVE YOU THE BENEFIT OF DOUBT, AGREEMENT OR NO AGREEMENT WE'LL GO AHEAD WITH THE JOB, LET GOD ALMIGHTY BE THE WITHNESS BETWEEN US. PRAY FOR US FOR EXTRA ENERGY AND GRACE TO COMPLETE THE WORK ON SCHEDULE. WE'LL KEEP YOU POSTED ON THE PROCEDINGS. Ah that's the spirit now Prince Paddy.. It is no problem for me to sign any documentation you need me to at all. If you feel you do please don't hesitate to send it. I just came home and heard your message. You asked about the width. I had not considered that. To be honest I think I will leave that to your judgement as you or whomever will be more capable to decide the proper width from the dimensions I've already given. Basically I would like to see the Ice Sculpture from afar. I mean it must be of a decent size and not a miniture thing. Seeing as though you can't come up with a dimensional ratio on your own I guess I will. I would like it to be 4 inches wide. ITS NOT AS IF WE COULDN'T BE ABLE TO COME UP WITH A DIMENTIONAL RATIO ON OUR OWN BUT WE ALWAYS WANT TO MAKE SURE THAT THERE IS NO MISTAKE AND WE ALWAYS WANT TO WORK TO THE SATISFACTION OF THE COSTUMER. 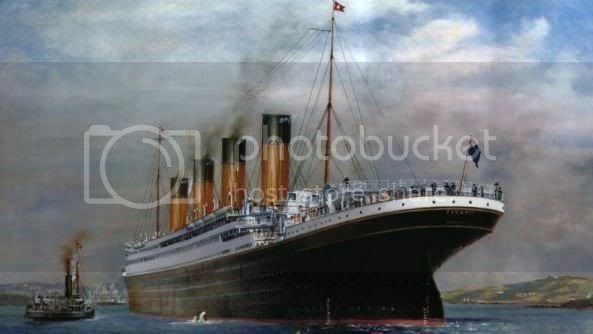 WE CAN DO MUCH BETTER THAN YOU CAN IMAGINE PRESENTLY IN OUR GALLERY WE HAVE A SIMILAR PIECE BUT NOT A TITANIC SHIP AND ITS QUITE BIGGER THAN YOUR MESUREMENT. DO YOU HAVE ANY PREFRENCE IN COLOUR? LETS KEEP IN TOUCH. Well this is great news. I'm so glad I have found your company. As for the colour. I think it's best to leave it the same colour as Ice. Dying it would spoil it I think. KINDLY BEAR WITH US WE ARE DOING EVERYTHING IN OUR POWER TO MAKE SURE WE MEET UP BEFORE THE WEEDING DAY. 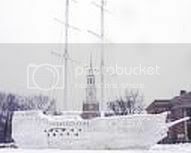 WE ARE HOPEFUL THAT THE ICE SCULPTURE WILL BE READY ON OR BEFORE 30TH OF THIS MONTH. SINCE THE WEDDING IS COMING ON THE 2ND ACORDING TO INFORMATION WE RECEIVED EALIER, I BELIEVE WE CAN BE ABLE TO DELIVER. TO BE HONEST WITH YOU THE WORK IS NOT AS EASY AS YOU MAY ANTICIPATE BUT WE WILL DO OUR BEST TO DELIVER. I just read your mail. That's great news about the Ice Sculpture. I am so pleased and relieved everything is coming together. I noticed you said the wedding date is the 2nd of February. I don't know what makes you think that. It is on the 22nd of Feb. So please don't rush it. We still have a couple of weeks. Well take care and I hope to hear from you soon. Thanks once again for the trust and confidence you put in us, you will never regret it. We will do our utmost best to give you something to cheer. subject Re: EVERYTHING IS IN PROGRESS. I am getting nervous at this stage. It has been almost two months now and the wedding is one week away and there seems to be no progress at all. I really need to know what is happening. I am beginning to think I should just forget the whole thing. I really wanted this to be a special event for my daughter and her fiance, but I just don't know now. I still don't even know what airport to send the courrier to yet????? Please don't be nervous for whatever may be the case, we have already given you our words and come what may we must surely deliver before the D-day. However we are really sorry for the delay its is due to unforseen circumstances beyond our control. 1) Due to incesant power failures which started couple of months back, sometimes we may stay days without light, and that has not been helping us at all. 2) The first sculpture we started with the measurement of 10" by 2ft, half way we discorvered that with the 2ft length we might not be able to get all the conpornents on the titanic ship as it was on the original, we then have to abandon the first size of 2ft length and started a new one that is almost 3ft length. Do not be discouraged about the length or size there is not much diffrent between the first and the later, we just want to make sure that all the carbins and conpornents are included. We are almost at the point of completion, and we want to asure you once again that you will surely have the sculpture before the D-day of the wedding even if it is a day or two to the wedding day. For the airport, the nearby airport to us is Kotoka International Airport, Accra, Ghana. Once again bear with us for the delay, be assured that we will surely deliver. Well it looks like we won't get to have the sculpture at the wedding. But I still want it. I will give it to them when they come back from their honeymoon. I finish things I start. So I need to know what the situation is. We are really sorry for the delay in delivering the sculpture before the wedding day. We want to thank you for the trust and confidence you have in our company, once again we want to assure you that you will not regret it, as soon as we finish the job we will get you informed. At the moment we have few finishing touches to make and the sculpture will be ready. Please acept our sincere appologies and send our best regards to your daughter and the husband. Thanks once again for your understanding and God bless you. We sincerely appologise for the delays in completion of your work and sending of the pics. However we are finnally through with the work. Here are some of the pics for your peruvial. Well I must say I was totally surprised today when I checked my mail. I've been away to Brussels with my wife for the past week. Now lets get to business. I am confused as to what exactly the sculpture is made of? I asked for an Ice Sculpture and it looks like a wooden one. However I do not mind as I'm totally impressed and I shall gladly pay for your work and efforts. A friend of mine called Mrs. Skara Moosh is a collector of fine foreign art and this certainly fits into the category. She's an elderly lady and very wealthy and she has taken an interest in your work. She has asked me to have the sculpture posted to her so she can inspect it. If she likes it and I'm sure she will then she will want to commission you to do more work for her. Below is her address, so if you can post the piece as soon as possible that would be great. Whether she likes it or not I will be sending you your money. So what I need you to do is send me a bill for all the work and post and packaging. Once Lindsey decides what to do I will send you all the money including a refund of your expenses and an extra thousand for going to all this trouble. I am so excited about this. It could turn out to be a great a little business. You do the sculptures and I can get you wealthy customers. Let me know when have sent the sculpture. It's good to hear from you again, I was unable to reply to your message because I travelled to Lagos Nigeria on a business trip. We tried our utmost best to reach you both on e-mail and your phone lines before my trip to non-avail. To be honest with you our company was not too happy when we tried getting to you and there was no response. They put all kinds of blames on me acusing me of going contrary to the company's rules and regulations. We will appreciate you if you get us more wealthy customers who will be intrested in our work but we want clearification on what you mean by posting the piece to the address of your friend (Skara Moosh) Do you mean the sculpture its self or the photographs? Please get back to us as soon as possible to enable us know what to do next. Well our communication seems to be very inconsistent. It's such a shame but nothing to get discouraged about. Everything has changed since you emailed me those pics. At 1st I was so impressed but then my business mind kicked in and I emailed a wealthy woman with an interest in your work. I want to make money. You want to aswell I'm sure. We are businessmen. But in order for her to buy more of your work she wants to see and hold it. That is why I asked you to post the sculpture to her. In order for her to go along wih this, she wants proof of your seriousness and genuinity. I've tried to explain evrything we have been through but she wants more. That's wealthy women into art for you I guess but I think it will be worth it in the long run. By accident I've discovered an African artist that has people willing to provide their skill and heritage to wealthy English people with more money than sense. 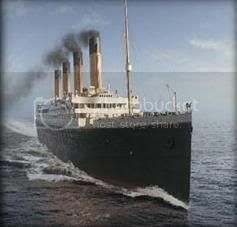 Either way this is an oppurtunity for us both and all you ned to do is post Mrs. Skara Moosh the Titanic Sculpture. 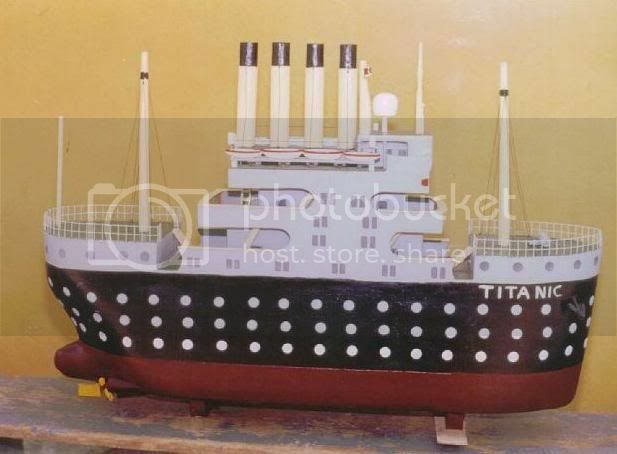 What you are asking us to do seems difficult if not impossible, how do you think in your wider immagination that after investing so much money and time in getting the Titanic Sculpture done, you want us to spend another money to ship it to an unknown destination.What is the gauranty that we will get our money when the sculpture gets to you. If you or Skara Moosh can pay part of the money then we sign a written agreement that you will pay the balance money after inspection then we can send it through courier people that will bring it to your door step. The pics we send to you is enough evidence to prove our genuity and seriousness. If you want us to do this business together we are ready to give you the maximum co-operation if only you are sincere to yourself, we can do much more than this. We can get the sculpture done with ceramics, marble etc. We hope you do understand our point. Besr regards and Happy Easter. I asked for an Ice sculpture. The fact you didn't and couldn't deliver this in the time frame I asked is not my problem. I have decided to ask a friend of mine to invest in your company because of her love of WOODEN sculptures. So if you wish this to work. ALL she has asked is for you to send her 1 product which you have created. If this cannot happen and I understand your dilemma but nothing else will happen and NO money will be exchanged. So if you want our trust and continued interest, then send the sculpture to Mrs. Skara Moosh and let's do the fandango. 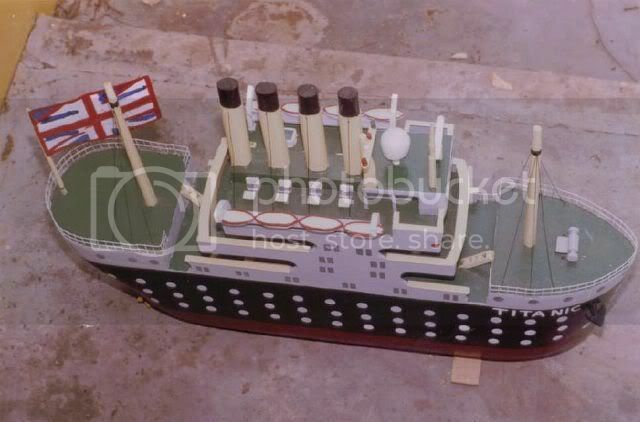 Oh dear, the Titanic has sunk again. My ribs are aching at this one!